Let’s talk breakfast. I’ve been on the search for the perfect breakfast taco but what I’ve come to realize is that I’m not sure there is one. Something about scrambled eggs on a taco doesn’t sit well with me and it could be because I love huevos rancheros so much. 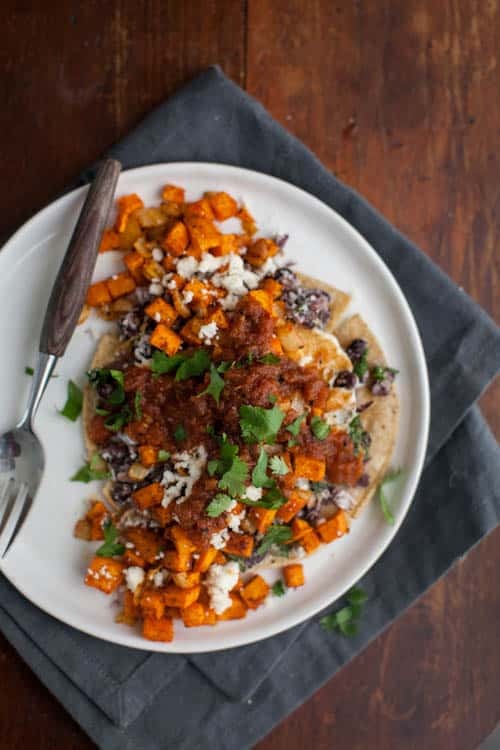 I still get the crisp tortilla smothered with eggs, beans, and salsa but I can really pile anything on like (say, sweet potatoes!) I love the method of frying the egg directly on the tortilla (which I picked up from Smitten Kitchen). I added a layer of mashed beans on the tortilla too. While it created a bit of a mess when I flipped the tortilla, it was well worth it. Preheat oven to 425˚ F. Toss cubed sweet potatoes, onions, and olive oil with the spices. Spread in a single layer in a baking dish. Roast for 20 to 25 minutes until sweet potatoes are tender. In a bowl, combine black beans, lime juice, and cilantro. Mash together and set aside. When sweet potatoes are about done, brush both sides of the tortillas with olive oil. Heat a griddle or large skillet over medium-low heat. Add tortillas and cook until starting to brown on one side. Flip, divide mashed beans between the two tortillas, and crack 1 egg over the beans. Reduce heat to low, cover, and let cook until the egg whites are set (see note). To serve, plate 1 tortilla with 1/2 the sweet potato mixture and sprinkle with cheese, salsa, and avocado. Serve with extra lime juice if desired. Occasionally I prefer over-medium or even over-hard eggs. To do this, once the egg whites are beginning to set, carefully flip the tortilla over and let cook for 1-2 minutes. Move tortilla to the plate and fill in with any beans that might have fallen out during the flip. 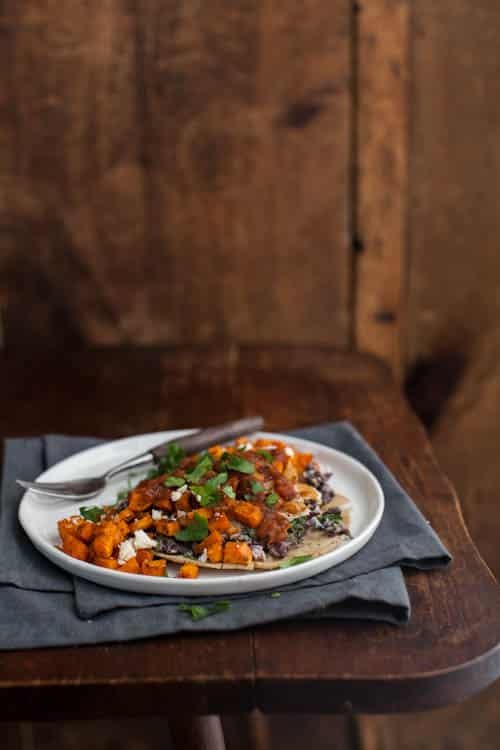 Sweet Potatoes: Use cubed butternut squash or pumpkin in place of the sweet potato. Salsa: Ditch the salsa for hot sauce or play around with homemade salsa (like using this roasted tomato salsa). Avocado: Beyond adding avocado, take it one extra step and make guacamole. I hear your words with this one sister, organization can only go so far but I also feel like I’m chasing something and trying to catch up constantly. Planning works, but it’s that feeling of “being on top of it” that I’m searching for. Hopefully we both can find the best way to navigate this journey! Also, thanks for passing along the link, I just signed up to donate a post! I actually thought your post was totally reasonable…but maybe that says something about how orderly my mind/life is. 😛 Huevos rancheros! Can’t get enough. Hard to say whether there is a perfect breakfast, I tend to stick with one thing for a while and love it and then get totally sick of it and never want it again. 🙂 This looks amazing, I posted something similar on Monday, sweet potatoes were meant for breakfast I think! I just started full time blogging and I completely understand! Some days are much more organized and productive…others are less so (like today)! The shared workspace would be great and I love your idea of a workspace complete with kitchen and photography area! Here’s to dreaming!! Yum! I often have a fried egg or two with baked sweet potato for dinner. In my dreams this breakfast was born! 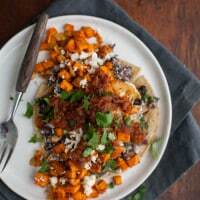 LOVE huevos rancheros and anything sweet potato. Can’t wait to make this! Thanks for posting about the lunchbox fund – that sounds fantastic! It’s so refreshing to read a post like this. Who really has it all together, anyway? And of course thank you for the tasty recipe! I could eat this 3 X a day!